All the options for various activities and the popular places to take the kids make a Destin, Florida vacation rental by the beach is an exciting experience for your family! Fish, golf, and enjoy the Annual Seafood Festival on Florida's panhandle surrounded by the beautiful blue-green waters that give the Emerald Coast its name! Learn more here! Park Row Twelve - Brand New Home- Introductory 2019 Pricing!! Beach Front 7 Bdrm Home with Elevator!!! Spring Breakers Welcome! All the options for various activities and the popular places to take the kids make a Destin, Florida vacation rental by the beach is an exciting experience for your family! Fish, golf, and enjoy the Annual Seafood Festival on Florida's panhandle surrounded by the beautiful blue-green waters that give the Emerald Coast its name! Destin, Florida is a small resort city on the Florida Panhandle near Fort Walton Beach and Pensacola Beach. Part of Florida's "Emerald Coast", Destin is famous for its white sand and green water. Made of pure Appalachian quartz, sand along the Emerald Coast stays cool even during the summer, and gives the ocean a distinctive green hue. Go Fishing on the Destin Harbor! 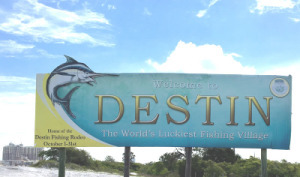 - Destin is called the "World's Luckiest Fishing Village". It has one of the largest fishing fleets in the US! Come in October to Celebrate the Annual Seafood Festival - Compete to win the biggest catch of the day! Enjoy Golfing at the Kelly Plantation Resort - Located a few minutes drive up the Emerald Coast Parkway, it offers unparalleled gulf views. Go Shopping! - Destin offers some of the finest shopping in the nation at the Silver Sands Factory Stores, the largest designer factory in the nation! 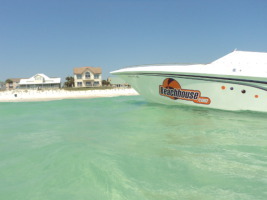 BeachHouse.com offers several gulf front homes perfect for a family adventure. 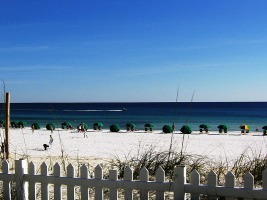 Destin has several beach access points, notably at the Henderson Beach State Park. This park is a great place to take your family during your vacation, and is the location for several annual Destin events. Sound enticing? Try a Destin rental today! Want to know more about Destin? To learn more about this popular Florida city! And here's for our full list of Florida beach house rentals! Check out for other nice places to stay in Florida! First time getting ready for a trip? Don't make the same mistakes as everyone else! Find out why you should book now to be ahead of the game!